Easy Like Sunday Morning . . . I love my weekends, and love the fall of the year . . . I had to go out of town on business this week, and we had a little rain while I was gone . . . I was so pleased to go out back, and visit with them when I returned. I love to pinch . . . pinch . . . pinch them, and deadhead them also!!! Your flowers are bright and very pretty. colors are fitting for autumn. 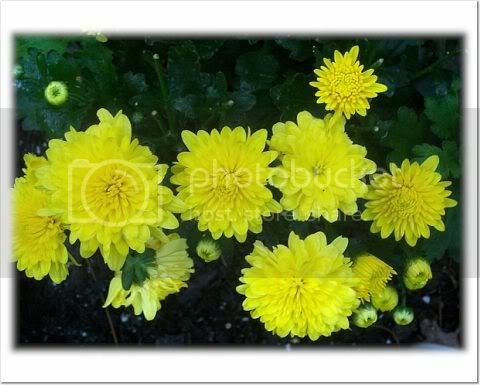 Mums are such cheery flowers to have in the garden during autumn as they really brighten the place up don't they? Yes . . . and are so easy to care for . . . I do worry about them weatheringing through the winter though . . . Will they survive if if cover them good with pinestraw,perhaps?? ?